The major projects planned for 2012 are to install the rest of the first floor flooring, hang the remaining interior doors, install kitchen cabinets, install kitchen range, kitchen and bathroom counter tops, kitchen sink, bathroom lavatory, ceiling installation, finish fixing the drainage problem behind the cabin, and finish the water supply pipe run. 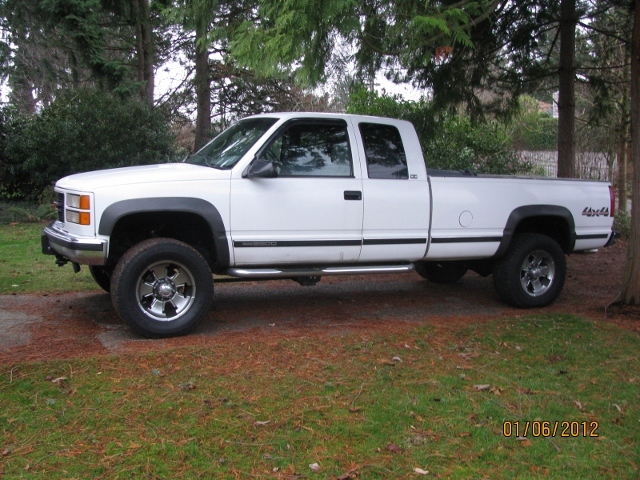 1/3/12 This is the new truck I bought to replace the one I totaled on Christmas Day. 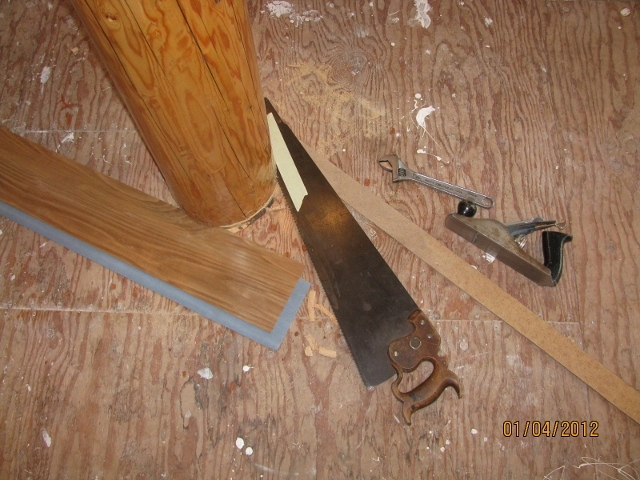 1/4/12 This picture shows the tools I used to cut the notch around the bottom of the columns which will receive the flooring panels. The notch is a quarter of an inch high and a half inch deep all the way around. The flooring will go into the notch a quarter of an inch. The notch was cut using the hand saw with the piece of tape on it for a depth guide to cut two kerfs. 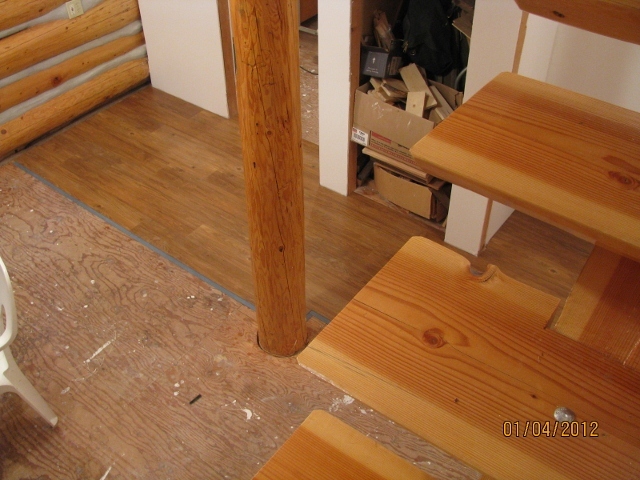 The lower kerf is level with the subfloor. The higher kerf was cut by resting the saw on the strip of masonite you see. The masonite was planed down, (with the hand plane,of course), to the right thickness to position the kerf correctly. The crescent wrench you see was used as a poor man's micrometer to get the thickness of the masonite right. 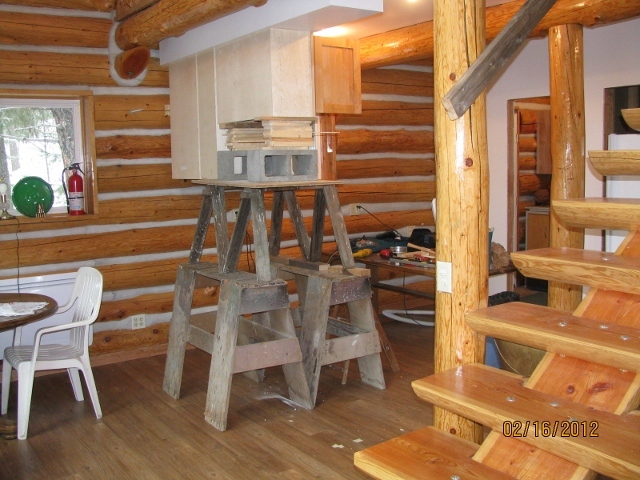 1/5/12 Here is the start of the flooring in the kitchen and hallway as seen from the loft staircase. 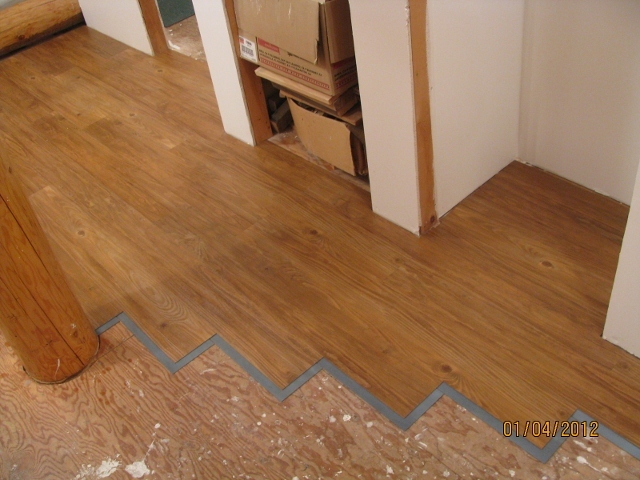 1/5/12 Here is a closer view of the start of the flooring showing the inside of the linen closet. 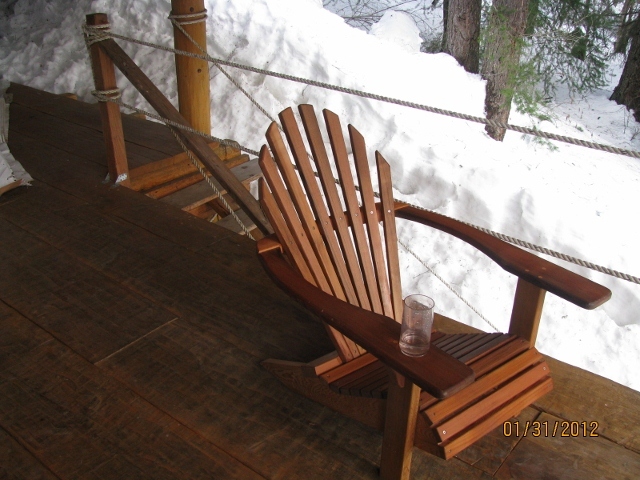 1/31/12 This is the beautiful Adirondack chair Dave made for us for Christmas. It will fit right in on the porch. 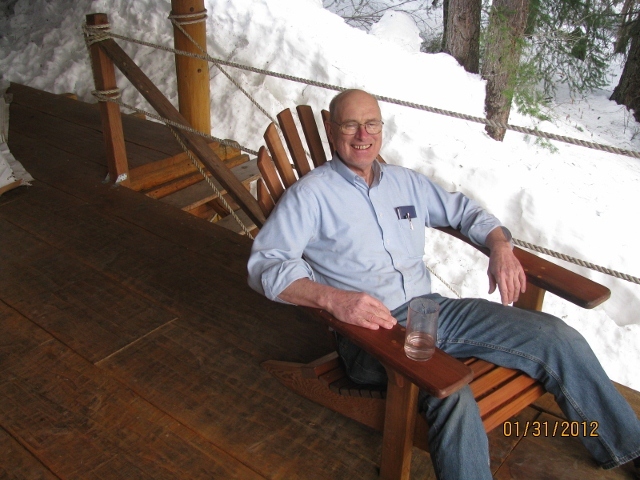 1/31/12 Here is Paul relaxing in Dave's Adirondack chair. 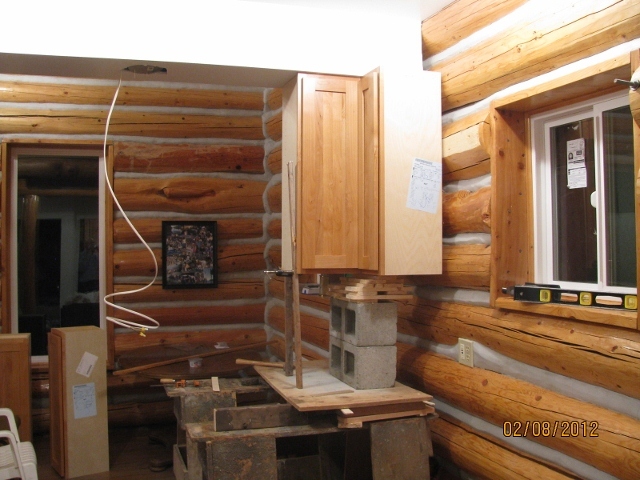 2/8/12 The first overhead kitchen cabinet unit being held in place by a jury-rigged scaffolding. 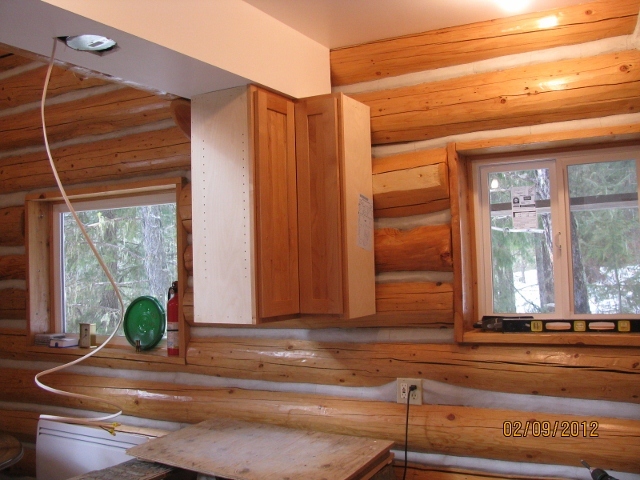 2/9/12 The first kitchen cabinet unit is securely fastened in place. 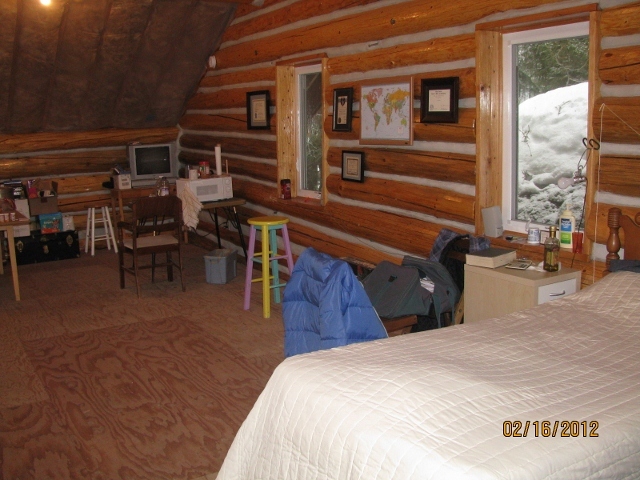 2/16/12 This picture is included just to show you my living quarters up in the loft. You see my bed and night stand in the right foreground; the small table with the microwave where I eat my meals while watching courses on DVD; the large table, mostly out of view, on the left where I store dishes, food, and clutter. It is spacious, comfortable, and delightful. 2/16/12 The kitchen cabinet unit that will hold the range hood is held in place by the scaffolding you see prior to being screwed firmly in place. 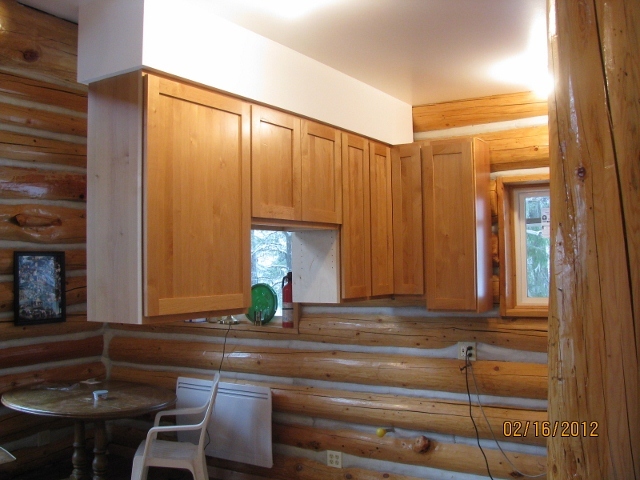 2/16/12 All of the cabinet units hanging from the soffit and to the left of the kitchen window are installed. ©2012-2019 Paul R. Martin, All rights reserved.